As the old saying goes, real estate is about 3 things: location, location, location. The same holds true for online advertising. In order to be effective, ads need to show up on the proper places. Otherwise, consumers either overlook them entirely or become irritated at their very presence. You pay every time a user clicks on one of your ads, which is why your ads should only appear on pages where they're likely to produce conversions. AdMedia's Contextual algorithm bases your ad placement on keywords as well as the content's theme. This way your ads appear in front of an interested audience whom appreciates your offers. The AdMedia network contains thousands of the top Publishers on the web; no matter what you're selling, you'll find a place for your products among hundreds of related verticals. 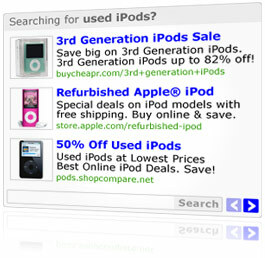 The Contextual product also incorporates a revolutionary new technology called Search Engine Retargeting. This amazing tool incorporates users' own keyword queries into your ad copy as they continue to browse other sites. Consumers are more likely to respond to their exact text, which creates a powerful association between your brand and their needs. You'll be able to see how well this system works with our real time tracking database. There you'll find all the important stats associated with your account. Since the figures undergo constant updates, you may access the database at any time. AdMedia also gives you the freedom to run a plain text ad or add an alluring, eye-catching image along with your ad copy.